The Egyptian pavilion won a top award at the multinational 2nd London Design Biennale, which opened on Tuesday, along with the US and Latvia. Egypt has been awarded the overall London Design Biennale 2018 Medal for the “most outstanding overall contribution." The award was for the country's installation, Modernist Indignation, an artwork that mourns the loss of the country’s modernist architecture, which has widely been demolished or poorly kept. 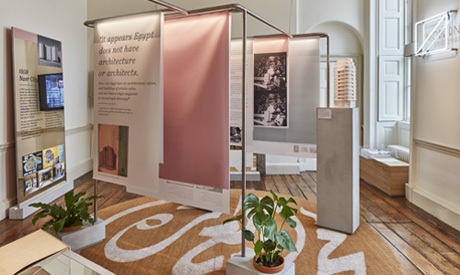 It presents a fictional 1939 exhibition put on by the editors of Al-Emara, the first Arabic-language design magazine focused on contemporary architecture in Egypt. The display’s chief curator is Mohamed El-Shahed - a specialist on modern Egyptian architecture, urbanism and visual culture - who founded his own magazine Cairobserver in the form of an online blog and a periodical print. El-Shahed was also the curator of Cairo Now Exhibition at Dubai Design Week in 2016, and The British Museum’s Modern Egypt project. The US won the Emotional States Medal, awarded for the most inspiring interpretation of the 2018 theme, for its exhibition Face Values. The festival's Best Design Medal went to Latvia for its exhibition Matter to Matter. Poland and China received honourable mentions, and a fourth award, the Public Medal which is voted by the visitors, will be awarded on 19 September. The Biennale, now in its second edition, will run until 23 September at London's Somerset House gallery. It first took place in 2016.